For the last few weeks I’ve more or less abandoned my newly revitalised business and focused my time encouraging people to vote for Labour in the General Election. Some have warned me of damage to my livelihood if I get into politics on social media. They may be right. We’ll see. it was clear from the outset that tory campaigning would be the same as it has been for many years now. Smears and lies seem to be the mainstay of the Tory battle-style. This time they went all out, aided and abetted by international media giants who shared their need to discredit the man most likely to stop them ripping off the majority here in UK. Their claims were outrageous. Jeremy Corbyn is a terrorist sympathiser. The ‘evidence’ is that he held peace talks with Sinn Fein and he wants us to stop bombing other countries. He also objects to the way that the present government sells arms to Saudi Arabia (a country that has strong links with ISIS) and turns a blind eye to the use of British weapons to slaughter innocent people in various states around the world. Diane Abbott is a racist. The ‘evidence’ is that she’s a black woman with the audacity to think she can tell white people to stop discriminating against other races. Labour can’t manage money. The ‘evidence’ is that all previous Labour governments combined have had to borrow less money than the tory governments of the last 6 years. Corbyn is unelectable. The ‘evidence’ is that he has been an elected MP for decades and has recently been overwhelmingly elected by the Labour party TWICE in recent years. Labour can’t explain where the money will come from – there’s no ‘magic money tree’. The ‘evidence’ is that Labour’s manifesto was fully costed and workable with a £3.9 billion per annum cushion to protect us from unforeseen eventualities. This is in contrast to the tory budget which was not costed. Labour is the party of high immigration. Immigration was lower under the last labour government and the manifesto laid out plans to reduce immigration again. The tories scrapped Labour’s main border controls under Home Secretary Theresa May, thus making it harder for UK to regulate immigration than it had been under Labour. Labour’s corporation tax plans will drive companies away. In 2010 Corporation tax stood at 28% (lower than in any other G7 country). Labour planned to raise it back up to 26% (still lower than any other G7 country). Where exactly will these companies go? Corbyn has no principles. 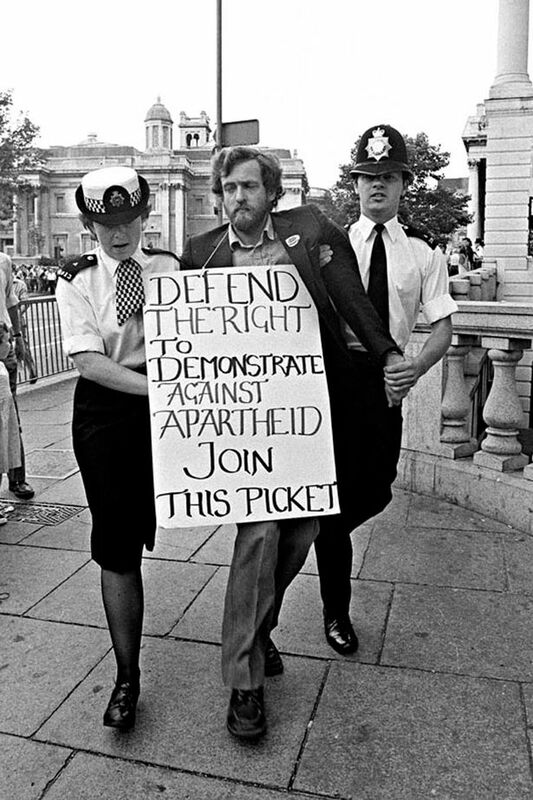 The ‘evidence’ is that he has stuck firm to his principles of peace, equality and fairness throughout his career, even when his opposition to apartheid (whilst the tories were cosying up to the White supremacist South African regime) led to his arrest for protesting. By way of contrast, Labour stuck to facts and policies. The Labour party advertised its policies well and highlighted the policies of other parties to ensure that people really understood the issues at hand. They highlighted hypocrisy and sleaze within the tory party only when they could back it up with facts – and there were many facts. Yet still – the main focus was not on the politics of hatred and smear but rather on information sharing and genuine concern for the democratic process. And the people responded to that. No Labour victory because Corbyn didn’t gain the most seats. Absolutely. Labour didn’t gain the most seats. That’s not the point. This election was supposed to consolidate the tory overall majority and consign Labour to electoral oblivion. 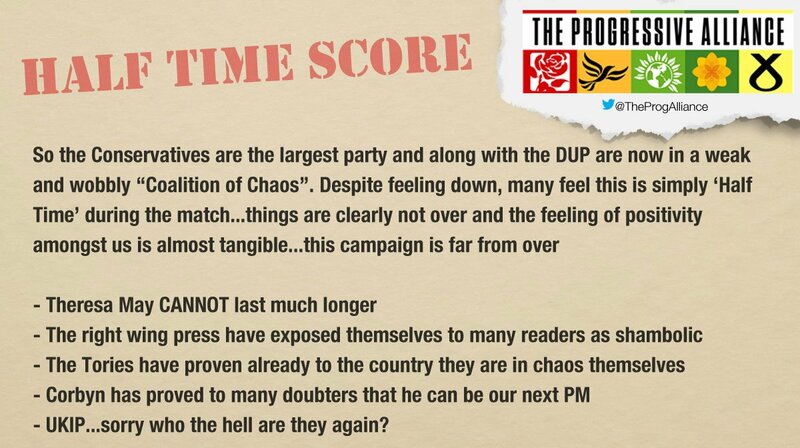 Instead the tories have been humiliated and the Labour party has, in just 7 weeks done what the political pundits claimed was impossible. And they did this despite 2 years of media attack on Jeremy Corbyn and even attacks from within their own parliamentary party. Just imagine what would have happened had the General Election been planned for 2 weeks later? Just imagine what will happen when this weak and wobbly government falls and the next General Election is called (presumably before the end of 2017). It’s just naïve children voting. What do they know? Actually that’s not the case. It’s true that young people have come to see the point of voting but so have many people from other age groups. British people of all ages have become increasingly disillusioned with politics ever since Blair watered down socialism so much that there was nothing left to choose between left and right. Jeremy Corbyn has revitalised British politics and the people have responded. Socialism will never win another election in UK? Really? What political ideology just climbed over 20 percentage points in 7 weeks? And with that evidence behind him Jeremy Corbyn should easily unite the despairing Blairites who believed the neoliberal deception and persuade even more left wing voters to come out and vote next time. Prepare for a Labour landslide. if someone believes that all compassion is insincere they must believe that all people are incapable of compassion. Since nobody can really know that about anyone except themselves the person using virtue-signalling as an insult is really just displaying their own lack of compassion, their own inability to empathise with the victims of tory ruthlessness. No wonder their electoral choices are beginning to fail. A nation built upon callousness and indifference cannot stand for long. So thankyou to all who voted Labour this week, especially those who voted for the first time. Together we have shown what can happen when people with integrity oppose the dis-virtuous and turnout in numbers. We’ll need to do this again soon but probably only once. Then we’ll have 5 years in which to see Labour rebuild our divided, despairing society. Thankyou for restoring my faith in the Great British people. Now then – where’s that book of Mental Health law got to?